The design of this lamp is an inspiration from a cord-quilted bed cover made in England or Ireland around 1730 to 1750. The original pattern from the Williamsburg collection is an oval shaped lattice design that alternates the garland branches at six inch intervals. 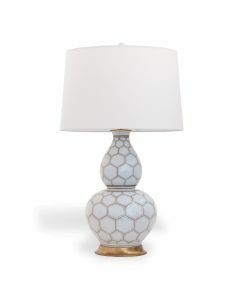 This gorgeous lamp features the lattice in slate blue on a matte crackled glazed porcelain urn shape. 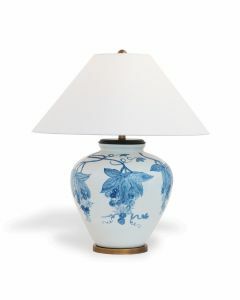 Scaled for bedrooms or side tables, the pattern on the lamp is modern, yet classic. Accents are of finished aged brass. Features a ring finial, 3 way switch and 100 watt max. This lamp measures 29"H x 17"Dia. and the shade measures 13" x 17" x 11" SH. The shade is an empire soft back shade with single fold trim with a brass spider and is made of off white polyester fabric. Click on images for greater detail.